Tammy Morts, the owner of Roadrash, was inspired to create the picture frames by being surrounded her whole life by a family of stunt performers in the motion picture industry. 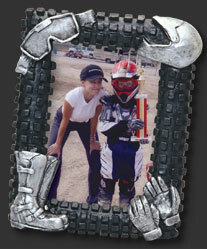 When her very young son needed a cool frame to show off his killer jump on his dirt bike, thats when it all began. Check out the pictures of her husband Billy catchn air on Mission Impossibe II and her son Tristen now 7 trying to follow in his daddys foot steps. Tammy and the Roadrash team would like to help you help your customers catch their action too! We look forward to being partners in profit with you. What is Roadrash the word? Answer: Raw skin from a crash or wipe out. What is Roadrash the company? Answer: Picture frames....Extreme sport picture frames. What are Roadrash picture frames? Answer: They are 5x7 wooden black frames with 3 dimensional sport figures affixed to their borders. What sport figures are featured on the picture frames? Answer: Dirt Bikes, Quads, Street Bikes, Snowboards, Skateboards, Personal Watercrafts, BMXs, and more to come. Who are the potential customers buying these frames? Answer: Almost everyone! Almost everyone has a photograph of a family member, friend or himself/herself participating in an extreme sport. The desire to have a frame that closely resembles their activity is not being met in the current market place. Until now! Our production of frames depicting Dirtbikes, Quads, Streetbikes, Snowboards, Personal Watercrafts, BMXs, and various other extreme sports is warranted by the increasing market in these activities. These frames can be used as gifts, as well as decoration in the home or office.